Hanway's Act survived the 1834 Poor Law Amendment Act and unions continued to send their children to privately run establishments, the largest of which were Mr Aubin's at Norwood and Mr Druett's in Tooting. The Act was however repealed in 1844 by which time the Poor Law Commissioners were attempting to persuade groups of unions to set up District Schools. By 1850, only two private establishments remained in operation for taking paupers under contract from London workhouses. 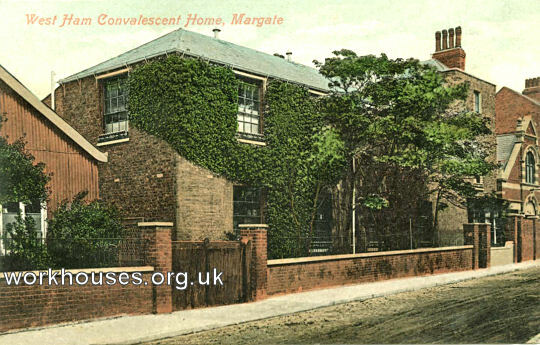 Both were located in Margate in Kent and were permitted to continue because they provided medical and convalescent care. One catered for adults while the other, the Metropolitan Infirmary for Children, took children from unions all over London. The Metropolitan Infirmary had been founded in 1841 and occupied a site at the north of Northumberland Road in Margate. 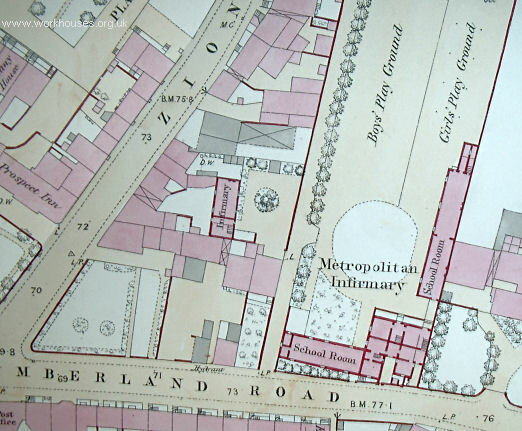 Metropolitan Infirmary for Children site, 1873. Metropolitan Infirmary for Children, Margate, early 1900s. The Infirmary treated children suffering from conditions such as scrofula (a tubercular disease affecting the lymph glands of the neck), rickets, and ophthalmia. Sea-bathing and sea-water baths were prominent among the treatment provided. Children at the infirmary also received school lessons during their stay there. In 1900, the Infirmary premises were later taken over by the West Ham union and continued to operate as a convalescent home for 150 patients.